Briefl y press the closed padlock to lock the vehicle. Press and hold the closed padlock to close the windows automatically in addition to locking (according to version). 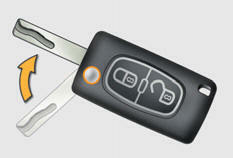 Turn the key to the right in the driver's door lock to lock the vehicle. Long press on the closed padlock to lock the vehicle and also close the windows (depending on version). Short press on the closed padlock again within five seconds to deadlock the vehicle. 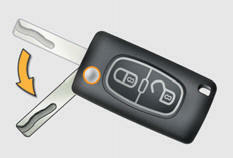 Turn the key to the right again within five seconds to deadlock the vehicle. 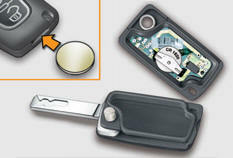 This function allows you to identify your vehicle from a distance, particularly in poor light. Your vehicle must be locked. Press the closed padlock on the remote control. This will switch on the courtesy lamps and the direction indicators will fl ash for a few seconds. contact a PEUGEOT dealer as soon as possible. On opening the driver's door, an alert message is displayed, accompanied by an audible signal, to remind you that the key is still in the ignition switch at position 1 (Stop) . If the key has been left in the ignition switch at position 2 (Ignition on) , the ignition will be switched off automatically after one hour. 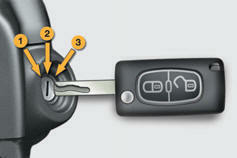 To switch the ignition back on, turn the key to position 1 (Stop) , then back to position 2 (Ignition on) .